Reason & Feeling: Steel & Velvet. At the end of the 50s the working world became modern: With the emergence of the service economy, more and more office workplaces were created. Of course, the furnishings were all about rationalisation: the furniture had to be practical, durable and inexpensive. At the same time, however, they should also radiate progressiveness and optimism – because the design of office space was also becoming increasingly important as a component of corporate identity. From the Aluminium Group by Charles & Ray Eames to Arne Jacobsen’s famous HEW building in Hamburg: many Midcentury designers have developed some of their most convincing designs for the office. George Nelson’s „Modular System“ – and his „Steel Frame Collection“, which he designed in 1954 for the office furniture manufacturer Herman Miller, and which is now less common – became very well known. It includes seating, sideboards and tables, all based on steel frames in white or black. 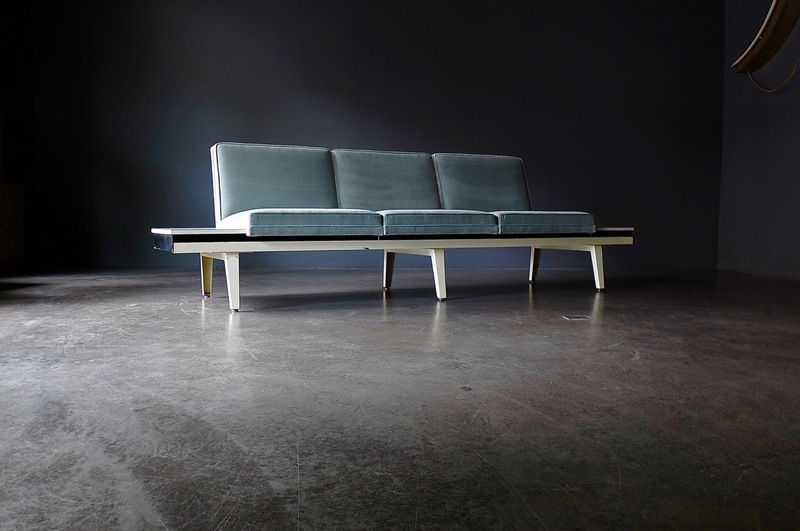 Our current sofa consists of 1 module that carries 2 half tabletops and 3 seating elements. The individual seating and table elements can be regrouped, i.e. placed in any position on the white powder-coated steel frame. In order to achieve a bit more elegance (which makes the sofa better usable for your living room, for example), we have re-covered the seating elements in delicate reed-green cotton velvet from Kvadrat/Raf Simons. But don’t worry, the practicality remains the same: The fabric is marked with 100,000 rubs (100,000 Martindale rubs, EN ISO 12947, more on the Kvadrat website). After all, the furniture should live to see the next Midcentury, too.